As part of the 2035 Comprehensive Plan, the Portland Bureau of Planning and Sustainability has proposed rezoning for several properties in the Buckman neighborhood along SE Stark Street, 12th Avenue, Belmont and Morrison. Some of the properties currently zoned for residential could be designated commercial, allowing for higher density development. Other properties, currently zoned for industrial use, could become EX, also allowing for commercial and residential uses. You can then submit your feedback, opinions or concerns these ways. Online: directly via the map app. Email: Send to psc@portlandoregon.gov with “Comprehensive Plan Testimony” in the subject line. Note: To be considered valid testimony in any form and included in the record, all comments must include the sender’s full name and address. Omitting this critical information will also deny the sender the option and eligibility to appeal. The deadline for public comment on all these changes has been extended to March 13, 2015, but don’t delay as the hearings are all winding down. Your opinions do matter. Speak to your neighbors about the proposed changes and organize them to send comments too. To contact the BCA and get help with land use and zoning issues, email: buckmanboard@googlegroups.com. Attached please find an updated copy of the Frequently Asked Questions (FAQ) memo. The memo includes three new questions (#1, #2 and #3). Question #1 includes information from the November 13th Planning and Sustainability public forum and the January 10th City Council session. It also includes information on next steps. Question #7 has been updated to include four additional upcoming apartments: three on N Mississippi and one on N Vancouver. A proposed set of near-term regulatory changes will be released the beginning of February 2013. A public hearing with the Planning and Sustainability Commission is now scheduled for March 12, 2013 at 12:30 p.m. at 1900 SW 4th Avenue, Room 2500 A. Public testimony on the draft proposal will be invited at the hearing. Longer term solutions will be discussed as part of the Comprehensive Plan Update. Our Portland community is experiencing unprecedented growth in the development of apartment buildings that include little or no off-street parking. Although a number of these types of older apartments remain along the former trolley lines, the approval of 28 new apartment buildings over the past 18 months has alarmed most of us. Due to the recent community outcry regarding the approval of so many apartment buildings with no parking, the City’s Bureau of Planning and Sustainability (BPS) is conducting a study of residents and neighbors of eight of these older buildings. As a group of volunteers that make up the Citywide Land Use Group, we felt it was important to conduct our own, complementary survey. This survey is the result of our Apartment Parking Task Force and Editing Team’s work on the no-parking issue over the past four months. It is our attempt to clarify your concerns and needs. We want to give neighborhoods the opportunity to provide constructive criticism to the City on this issue. In our view, the City, Metro, and the State are each dealing with competing goals. These include reducing air pollution, traffic congestion, and storm water run-off, while at the same time retaining and enhancing neighborhood livability, high density residential, affordable housing, living-wage jobs and vibrant local businesses. The recent development of apartments with little or no off street parking is a direct result of these policies. Portland is not alone in dealing with reduced parking in new apartment developments. Other cities we reviewed included Seattle, San Francisco, and Denver. Our contention is that the city needs to begin a dialogue with the neighborhood associations and business communities to help understand the impact of these goals and policies on our daily lives. We offer that Portland contains the most creative and enthusiastic community that could be brought to the table for this discussion. Together, it is likely we will come up with a range of ideas and equitable solutions. The results of this Apartment Parking Neighborhood Survey as well as the BPS parking study will both be presented to the Portland Planning and Sustainability Commission at their November 13th Forum. This is but the first step in helping broker a dialogue between the City of Portland and its concerned neighborhoods on this issue. The survey questionnaire should take you about 10 to 15 minutes to complete. 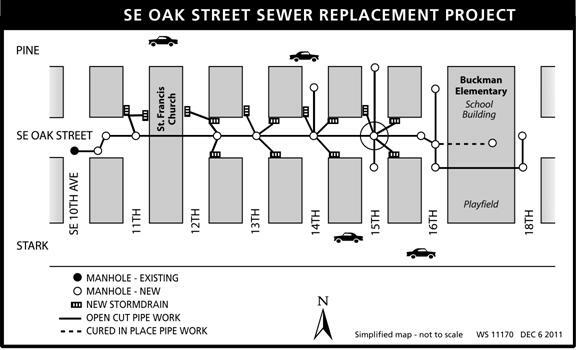 We recently received this e-mail from the city about the SE Oak sewer replacement project. Environmental Services has delayed this project until spring or summer 2013. The city was not able to secure all the easements necessary to begin construction this summer. The project now scheduled for next year will replace sewer lines in poor condition on SE Oak Street between SE 10th and SE 18th avenues. Email joseph.annett@portlandoregon.gov with “SE Oak Sewer Project” in the subject line to receive future project updates by email. You can also find current project information at http://www.portlandonline.com/bes/oakstreet. Last week, the Planning and Sustainability Commission (PSC) completed the second of three hearings on the Portland Plan. I am encouraged by the depth and thoughtfulness of the comments we have heard so far. The Commission will hold one more public hearing on November 29th and then will have work sessions in December and January. A final recommendation to Council is expected on January 10th. Your comments are extremely important to the success of this plan. Originally public testimony was to end on November 30th, just after the last PSC hearing, however several people have asked for an extension. In response, we have extended the deadline for written testimony through December 28th. Oral testimony will be closed after the hearing on November 29th. Thank you in advance for your thoughtful review and continued work with the Portland Plan. Written comments on the Portland Plan will be accepted until December 28, 2011. By mail: Send a letter with your comments to the Planning and Sustainability Commission, 1900 SW 4th Ave., Portland, OR 97201-5380, Attn: Portland Plan testimony. For more information or if you have questions, please call 503-823-1303. * What part of the plan are you testifying about? * What are the reasons you like something or would like to change something? Facts that support your reasons are always a good idea. * How does the proposal affect you or your organization? Because of the anticipated volume of testifiers, oral comments at the November 29th meeting will be limited to 3 minutes per person. This is the final public hearing open to testimony about the Portland Plan. The written comment deadline has been extended through December 28th, 2011, so if you are unable to attend this hearing, you still have the opportunity to comment on the Draft Portland Plan. The Portland Plan Has Arrived! This is your opportunity to make your voice heard about the Draft Portland Plan. Hearings are open to comment about any subject pertaining to the Portland Plan Draft. Please feel free to attend any or all of the hearings. Lastly, I am creating a “cheat-sheet” for SE Uplift Coalition neighborhoods to help you review the Plan. It will identify sections we think are especially important or interesting to our neighborhoods. This is meant to help people more efficiently read the Portland Plan and comment on sections that will directly affect your neighborhoods. We will post this on the SE Uplift website and send it out to people on our Land Use Committee listserve. If you have any questions or comments while reviewing the Portland Plan, please get in touch! I am happy to help you understand the Plan and find answers to your questions. You are currently browsing the archives for the land use category.